Product #46064 | SKU 800DSK | 0.0 (no ratings yet) Thanks for your rating! 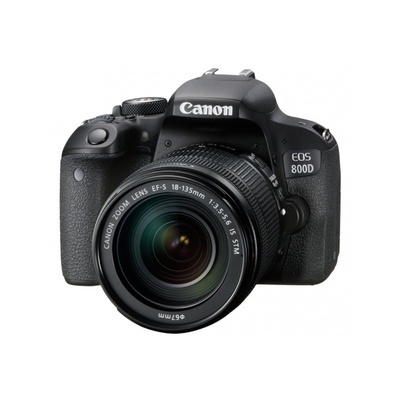 Packing a versatile feature-set in a sleek and portable body, the EOS 800D DSLR from Canon offers advanced imaging capabilities along with a convenient range of controls and connectivity. Utilising a 24.2MP APS-C CMOS sensor and DIGIC 7 image processor, the Rebel 800D is able to capture high-resolution stills and video with an expanded sensitivity range of ISO 100-51200 to suit working in a wide variety of lighting conditions. The sensor and processor combination also avails 6 fps continuous shooting for working with moving subjects. Benefitting the imaging attributes, the sensor's design also facilitates Dual Pixel CMOS AF, which uses phase-detection autofocus for quick, accurate, and smooth focusing performance when recording movies or shooting stills in live view. When shooting stills using the optical viewfinder, a 45-point all cross-type phase-detection system is used for quick and accurate focusing in a variety of shooting scenarios. Both a 24.2MP APS-C CMOS sensor and DIGIC 7 image processor are used to deliver high sensitivity and fast camera performance to suit both stills and video applications. A flexible native ISO 100-25600 range, which can be extended to ISO 51200, suits working in a variety of lighting conditions, and the processing capabilities minimise noise for notable clarity. The processor also contributes to a fast 6 fps continuous shooting rate for photographing fast-moving subjects. When recording video or shooting in live view, a Dual Pixel CMOS AF system is employed that offers smooth and fast focusing performance in a similar manner to how a camcorder acquires focus. This system integrates two separate photodiodes within each pixel to provide a broad and dense network of phase-detection gathering elements across a majority of the image sensor to reduce focus hunting for faster, more direct control of focus placement. When working with still imagery, this focusing system works to acquire focus quickly and accurately, making it ideally suited to shooting and tracking moving subjects so that critical focus is attained with each shot. When shooting video, a Movie Servo AF mode offers smooth and natural focusing when changing from different subjects or different distances within the scene, as well as the ability to specify tracking sensitivity, AF speed, and Face Tracking priority. Benefited by the Touch AF system, rack focus is possible simply by touching elements within the scene on the touchscreen in order to change focus in an intuitive manner. Subject tracking in movies is also heightened due to the Dual Pixel CMOS AF system's ability to recognise subjects and maintain focus when working within changing or cluttered scenery. In addition to stills recording, the 800Dalso supports Full HD 1080p video recording at up to 60 fps in the MP4 format with IPB compression, or 30 fps in the MOV format with ALL-I compression when making in-camera time-lapse movies. Video recording is benefitted by the inclusion of Dual Pixel CMOS AF and the Movie Servo AF focusing functions, as well as the touchscreen design of the LCD monitor for intuitive control. Movie Electronic IS is also featured to minimise the appearance of camera shake across five axes for smoother, steadier recording when shooting handheld. Additionally, an external microphone jack is incorporated in the body design for greater control over your recorded sound. Unique to most video recording systems, the 800Dalso features an HDR Movie mode that can be used to achieve greater highlight and shadow detail when recording in high contrast scenarios. This mode captures two HD frames at different exposures, one normal and one underexposed, in short succession at up to 60 fps and then composites them during playback at 30 fps to create a movie with a longer-appearing dynamic range. Included with the camera is the EF-S 18-135mm f/3.5-5.6 IS STM lens, which offers a 28.8-216mm equivalent focal length range. Its design integrates an STM stepping motor that provides near-silent focusing abilities with smooth and precise control. Additionally, the optical image stabilisation system helps to minimise the appearance of camera shake by up to four shutter speed steps in order to benefit working in low-light conditions and with greater zoom magnifications. One PMO (precision moulded optics) aspherical lens element and one UD (ultra-low dispersion) element are also incorporated into the lens construction to help reduce chromatic aberrations throughout the zoom range and an optimised lens coating has been applied, too, in order to lessen lens flare and ghosting for higher contrast, clearer imagery. A 7560-pixel RGB+IR metering sensor benefits both autofocus and exposure metering precision and enables Colour Tracking for more accurately detecting skin colours. Picture Style modes: Auto, Standard, Portrait, Landscape, Fine Detail, Neutral, Faithful, Monochrome, and User-Defined settings.Language support: English, German, French, Dutch, Danish, Portuguese, Finnish, Italian, Norwegian, Swedish, Spanish, Greek, Russian, Polish, Czech, Hungarian, Romanian, Ukraine, Turkish, Arabic, Thai, Simplified/Traditional Chinese, Korean, and Japanese.